Many new, and even experienced, investors often make the mistake of repeating the old saying that "investing in bonds is always safer than investing in stocks." It isn't necessarily true. Benjamin Graham noted that a better question investors should ask themselves is, "On what terms, and at what price [am I buying this investment?]". An example may help you understand the concept. Imagine you have a choice between two investments for your portfolio. The first is a bond that pays 8.5 percent interest annually. If the company goes bankrupt, this particular bond is third in line after other creditors for anything that remains once the assets have been liquidated, the real estate sold, etc. (This is called "liquidation preference." As a general rule, bondholders come first, then preferred stockholders, then common stockholders. But each company is different. The second investment is common stock of a debt-free company that trades at a p/e ratio of 10, which is an earnings yield of 10 percent. Approximately 50 percent of the profits are mailed to stockholders each year as dividends, resulting in a dividend yield of 5 percent. Management is good, sales are stable and growing slightly faster than inflation, and if something goes wrong, the stockholders are the first in line in liquidation preference since there are no bondholders or preferred stockholders ahead of them. In this scenario, you should consider the stock to be a safer investment than the bond. Surprised? There are several reasons to consider the stock in our example safer than the bond. The stock has nothing in front of it. It is first in line in terms of liquidation preference. 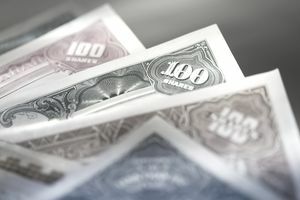 As Benjamin Graham said in the 1934 edition of the famous book, "Security Analysis" (the so-called "Bible of investing"), a common stock with nothing ahead of it must, by definition, be just as safe as a bond with nothing ahead of it because if something goes wrong, they are the first people in line to receive anything left after the employees, landlords, vendors, and other prior creditors have been paid. The bonds pay interest of 8.5 percent annually, but under current tax rules, this works out to a net yield of 5.53 percent because your interest income is taxed as ordinary income. That means someone in the top income tax bracket loses 35 percent of their bond interest to taxes, plus any state taxes that would be owed. The stock, in contrast, has a 5 percent dividend yield but dividends are taxed at a maximum rate of 15 percent. This means the dividend yield net of taxes is 4.25 percent. Thus, the difference between the two yields is not 3.5 percent as it would appear on the surface, but only 1.28 percent. It is possible, if things go well, for a stock to raise its dividend rate to help the investor keep pace with inflation as companies increase the price of their products and services. With a bond, you get the bond coupon rate, and that is it. If inflation went back to the years of Presidents Carter and Reagan, you would be losing purchasing power each year if you were locked into the bond. At least the stock has a chance of overcoming the challenge of high inflation, provided it isn't an asset-intensive business that requires a lot of money, such as a steel mill or a heavy construction firm. Why, then, does the myth that investing in bonds is safer than investing in stocks continues to persist when it clearly isn't true in all cases? Because most new and inexperienced investors mistake volatility with risk. (Volatility is the word that describes asset prices moving frequently, quickly, and sometimes violently higher or lower. A stock may increase or decrease by 50 percent or more in a year.) They are not always the same thing. It may not make sense to you, but there are a considerable amount of investors in the world who would be happy thinking they were earning 8.5 percent interest on their money each year, even if they only end up with 5.53 percent after taxes in a world of 11 percent inflation, then they would be keeping pace with inflation, actually gaining net worth and purchasing power over the long-term, but having to suffer through large drops and increases as the stock price fluctuates. They are deluded due to what economist Irving Fisher called "The Money Illusion." The truth comes down to Graham's point to his investing students: On what terms, and at what price? Bonds, as a form of investment, aren't necessarily safe any more than stocks are necessarily risky. It comes down to what is behind the security and how much you pay for it. It is the specifics of the potential opportunity that matter. You must do your homework.